In this research study, we demonstrate how RavenPack’s improved event detection technology and enhanced taxonomy allow investors to systematically identify key topics and market moving events. We also extend our previous work and move beyond using average sentiment as a signal for trading equities to leveraging the new RavenPack Analytics (RPA) taxonomy. We can design higher performing portfolios by taking advantage of asymmetries across the various topics or events covered in the media, and deliver higher risk-adjusted and absolute returns. 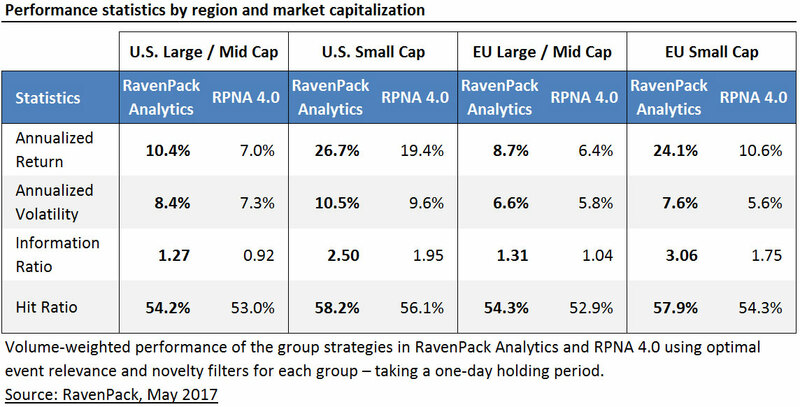 In a benchmark test, RavenPack Analytics outperforms its predecessor in all four test universes (refer to the figure below) with an average improvement in IR of 0.62, specifically with small cap companies. A leap of 60% in the number of statistically significant groups across region and size in the new version of RavenPack Analytics when using “topic” specific, novelty, and event relevance filters. Today, investors and traders are exposed to thousands of sources of financial news. From earnings announcements to mergers and acquisitions, credit ratings to macro-economic fundamentals, any piece of news has the potential to impact an investor’s portfolio. With the number of news stories growing rapidly, it is paramount for investors to dissect all this information in a timely and accurate manner to separate the signals from the noise. RavenPack Analyticstakes advantage of the latest innovations in Natural Language Processing (NLP) technology to provide deeper textual analysis of unstructured documents and help financial professionals identify the information that matters. With its latest version, RavenPack has significantly boosted its event detection and sentiment scoring capabilities, increasing the number of detections reported by a factor of four compared to its predecessor, RavenPack News Analytics (RPNA) 4.0. In addition, the RavenPack taxonomy has grown even more. The number of available equity events has expanded from around 1,000 to 3,317 categories. These event classifications are now organized into 56 broader groups. The overall taxonomy including global macro topics now reaches 6,895 event categories. Apart from the massive boost in detections and types of events, RavenPack Analytics expands coverage to more than 194,000 named entities. New entity types include top products, key business and political figures, and nationalities. New premium sources were added including Benzinga Pro, Alliance News, The Fly, and Factset. In this study, we only focus on events related to publicly traded companies. In our previous paper, “Introducing RavenPack Analytics for Equities”, we showed how RavenPack Analytics can deliver risk-adjusted returns1 across region and market capitalization (size) that are up to 50% higher than RavenPack’s previous product. We accomplished this by taking advantage of the new Event Relevance Score as well as the revamped novelty analytic. We showed how to boost the cumulative return profile by moving to a regression-based framework and documented how the coefficients on our equity sentiment indicators, derived from the Event Sentiment Score (ESS), are positive and statistically significant2 across both region and size, demonstrating their robustness and ability to generate alpha. In this study, we continue our use of linear regression models to determine the extent of asymmetry at the event group level in the RavenPack Taxonomy. In contrast to our previous paper where we treated all groups equally by pooling them together, we will analyze each topic or group separately using a group-specific version of our company sentiment indicators. Having previously determined that filtering by event relevance and novelty adds value, we will answer whether this applies to all groups or if any asymmetry extends to event relevance and novelty as well. The paper is organized as follows: Section 2 discloses the different data sources that we use and describes the available analytics. Section 3 describes our modelling framework. Section 4 compares the performance of RavenPack Analyticsto RPNA 4.0 on a group-by-group basis. Section 5 examines how we can improve the performance in RavenPack Analytics by taking advantage of asymmetrical behaviour in novelty and event relevance. Finally, Section 6 presents our general conclusions.